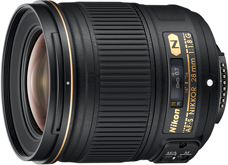 TOKYO - Nikon Corporation is pleased to announce the release of the AF-S NIKKOR 28mm f/1.8G, a fast, wide-angle, 28-mm f/1.8 fixed focal length lens that is compatible with the Nikon FX format. The AF-S NIKKOR 28mm F/1.8G offers the sharp rendering of a fixed focal length lens and a bright maximum aperture of f/1.8 that enables capture of images with pleasing blur characteristics. Utilizing the latest optical design, it is a wide-angle lens that is optimal for landscapes and snapshots with a wide angle of view, making it the perfect lens for capturing a broad variety of scenes that represent everyday life or more unique photo opportunities that arise with vacation and travel. Loaded with many technologies exclusive to Nikon, including Nano Crystal Coat and a Silent Wave Motor (SWM), the AF-S NIKKOR 28mm f/1.8G makes the most of the advantages of Nikon FX-format digital SLR cameras, including their superior image quality, with excellent rendering capabilities. The Nikon D4 and Nikon D800/D800E FX-format digital SLR cameras released by Nikon in early 2012 have received tremendous support from professional and advanced amateur photographers. The new AF-S NIKKOR 28mm f/1.8G follows the previously released f/1.8 lenses—the AF-S NIKKOR 50mm f/1.8G and AF-S NIKKOR 85mm f/1.8G—and responds to the needs of users who demand greater power of expression from a lens by maximizing the characteristics of FX-format digital SLR cameras offering superior definition and image quality. Nikon will continue to expand and strengthen the NIKKOR lineup with the steady release of new, high-performance lenses compatible with the FX format.